What royalties should companies pay? What can governments hope to earn in the future? Do the companies really need tax reductions? ​Access to contracts signed between extractive companies and governments can help answer questions like these. In many countries, however, extractive sector contracts remain closely guarded secrets and access to them has often been highly restricted, even within government. This limits the potential not only for effective citizen oversight, but also oversight from government bodies responsible for regulating parts of the industry. Seeking answers, a group of both expert and aspiring financial modelers met in October 2016 in a rather sleepy German town to begin the work of using public domain information to dig deeper into oil and mining projects in their countries. Berlin-based OpenOil has been championing the process to improve transparency in the sector. Malawians have been advocating long and hard for governments and companies to publish mining and petroleum contracts so that they might better understand the terms by which the country’s non-renewable resources are extracted. When Malawi joined the Extractive Industries Transparency Initiative (EITI) in 2015, civil society in Malawi made sure that contract transparency was in the first work plan. Although officials at the Ministry of Natural Resources, Energy and Mining said that hard copies of the agreements were publicly accessible at the Department of Mines offices in 2015, it was still hard for most people to access them. Six months later, the Malawi EITI Secretariat made two mining contracts available. These contracts were released on ResourceContracts.org. In doing so, Malawi became one of the majority of EITI implementing countries that publish contracts. Grain Malunga, a former minister responsible for mining in Malawi, and I used the 2007 mining development agreement for Kayelekera uranium mine, found on ResourceContracts, to build a financial model of Malawi’s largest mine, which contributed about 3 percent to the country’s 2013 GDP. The mine is operated by Paladin Energy. ​ResourceContracts documents are annotated by legal experts, meaning we had access to contextualized information about key obligations, including fiscal provisions, which aided in building the financial model. We examined possible future scenarios for government revenue and for the mine, which is on care and maintenance (meaning that production has stopped, but the site is being managed to allow for potential recommencing of operations at a later date) due to depressed uranium prices and high operating costs. As we modeled the fiscal regime, we learned that the break-even price—which the owner would need to obtain to cover the costs of extraction—was more than double the price of uranium at that time. The government has generated USD 12 million to date from royalties, but lost out on a further USD 15 million due to reduction in royalty rates. This was a result of mining development agreement negotiations that gave the Malawian government a 15 percent free carry equity stake in Paladin Africa, part of the Paladin Energy group of companies and the holder of the group’s interest in Kayelekera. We concluded that a further royalty reduction would only marginally increase the break-even price. ​Much speculation surrounds when or if the mine will resume operations. The model has improved public awareness of what factors need to change, such as price, production to resume. As part of the Malawi EITI multi-stakeholder group, I hope to use similar skills and tools to produce financial models for projects in the exploration phase. In doing so, Malawian civil society hopes to ensure that our expectations—regarding revenues as well as impacts on local communities—are grounded in reality. The ResourceContracts platform is an online repository of oil, gas and mining contracts developed in partnership between the World Bank, NRGI and CCSI. The site enables civil society organizations, members of affected communities, government officials, researchers, and other stakeholders to search for contracts; view summaries of contracts’ key environmental, social, operational and fiscal provisions; and download full contracts as open data. The site was relaunched in 2015 with new features and contracts. ​Rachel Etter-Phoya is an integrated expert on accountability, natural resource governance and public financial management at Citizens for Justice in Malawi. Between 2012 and 2014, France was considered a champion of corporate transparency by its European peers. In 2013, the French Parliament passed a law setting a public country-by-country reporting (CBCR) for banks which likely influenced the vote for the EU Capital Requirements Directives (CRD) a few months later. Public CBCR is widely seen as an efficient way to monitor tax strategies of multinational companies, forcing them to disclose information on their operations (turnover, profits, taxes, subsidiaries, etc) on a country-by-country breakdown (including tax havens). In 2014, France was one of the first countries to transpose the EU Transparency and Accounting Directives, setting up public reporting for extractive companies, different from CBCR but equally useful, commonly known as Payment to Government reporting (PtG reporting). However, despite promises from various government members and President Hollande himself, the extension of public CBCR to cover all large multinationals was never voted in Parliament. In mid-2016, in the aftermath of the Panama Papers, the French government introduced a new bill on transparency, the anti-corruption fight and the modernisation of economic life, commonly known as the “Sapin II bill”. Initially reluctant to establish a public CBCR, the government eventually backed down and introduced a watered down version of the measure. By introducing a watered down version of public CBCR, government claimed it was meeting everyone’s expectations halfway. But our data-stories illustrate how the provision introduced by the government would have allowed large companies to hide a considerable part of their activities. The government’s exoneration included a safe harbour provision. Thanks to this, companies reporting less than a certain number of subsidiaries in a given country (two, three, four, etc., as set by decree) would have been exonerated from disaggregating their report at country level, on the basis that it could represent a threat to their competitiveness. The Data Extractor created a data-driven story to build the evidence outlining how this exoneration would make the reporting essentially useless. Using data published by the company itself, we outlined that, using the lowest threshold possible (less than two subsidiaries), one of the largest French oil companies, Total, would have been exonerated to report in more than 30 countries, one third of the countries where the company operates. 1. Scraping the list of Total Subsidiaries from their annual report: Scraping data allows to turn data in rigid format (PDF, HTML) into open data. For PDF data, Tabula is usually the most performing program, but does not work all the time. Free online alternatives exist, such as OCR tools. In our case, Tabula did not work and we had to resort to online OCR tools. 2. Cleaning the dataset: it’s often necessary with online scraping tools that are less efficient than Tabula. We used OpenRefine, which also allowed us to organise the datasets and add some filters to the 900 entries. 3. 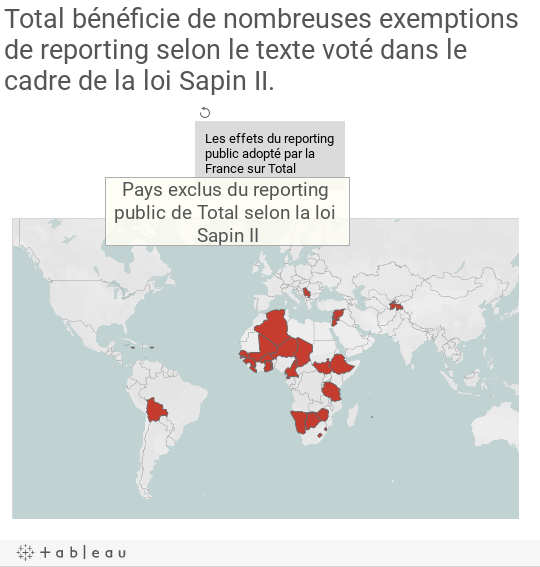 Visualising the dataset: we used Tableau, with support from Open Oil, to create an interactive map outlining which countries would be excluded from Total’s reporting. Interestingly enough, most of the countries where Total would be exonerated from reporting are countries where Total has extractive assets, countries where transparency is needed the most. During the day of the vote, a large number of MPs used our policy note and our figures on Total to demonstrate how inefficient the provision put forward by the government would be. Our position outlined the inadequacy of a reporting that would exonerate the biggest company from disclosing 1/3 of its activities. The figure was also picked up in a number of newspapers. A group of MPs introduced an amendment to set up a full CBCR, without exemptions. Unfortunately the amendment did not pass. Just before the vote, the government suspended the debates, called a few pro-government MPs and ask them to come back to the Parliament to eventually outvote the amendment by a couple of people (it was actually the second time they resorted to this tactic to counter a vote on public CBCR after December 2015). This data-driven case study shows how important it is to provide clear examples of law implementation of a fairly technical issue to our supporters, media, donors, but also, and primarily, MEPs. No one contested our figures that plainly illustrated the risks of granting exonerations. The advocacy carried out by civil society didn’t pay off as the amendment was rejected. Even worse, the French Constitutional Council declared the provision unconstitutional until its application at the EU level. Our advocacy work is now turning to the EU where debates on public CBCR are starting. The EU commission is supporting a version of public CBCR that is fairly similar to the one proposed by the French government.